According to IDG Research, 93% of all digital data will be unstructured by 2020. Unfortunately, with unstructured data volumes growing faster than anticipated, legacy scale-up storage architectures just don’t stack up: eventually, they hit a scalability limit, and the only available options are to either add another storage system or do a forklift upgrade and replace the existing system. 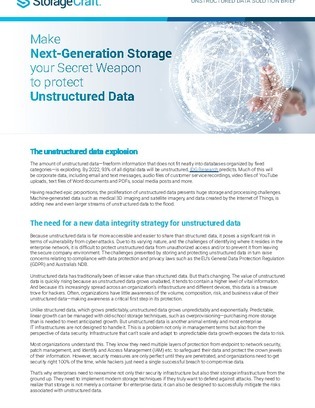 Download this paper to discover how to fulfill unstructured data management and protection needs using a purpose-built, scale-out converged storage appliance that consolidates primary, backup, and archival data. With this solution, there is no need to do battle with complex, sprawling storage silos as unstructured data volumes grow.